As we anticipate the celebration of the 200th anniversary of Walt Whitman’s birth on May 31, 2019—and the start of the World Series this month—we are reminded of the role the 1988 film Bull Durham played in connecting a new generation to Whitman and his love of baseball. 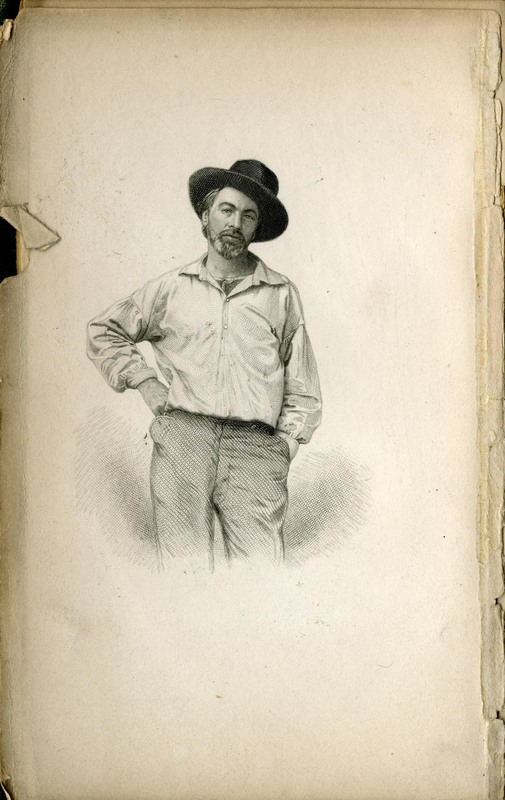 Exhibits and programming scheduled for 2019 will feature the poet and his writings, his Civil War work, and even the controversy around the naming of the Walt Whitman Bridge. But the Special Collections Research Center has the Whitman-baseball connection well-documented in the Traubel Family Papers. 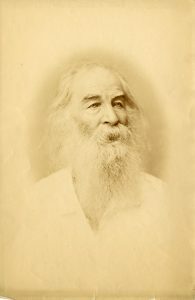 Horace Traubel, a writer and editor, his wife, Anna, and his daughter Gertrude knew Whitman in Camden, NJ, and worked to preserve his memory after his death in 1892. Traubel was one of Whitman’s three literary executors, and the family prepared much of the material for the multi-volume series, With Walt Whitman in Camden. Problem-Based Learning (PBL) is a teaching method commonly used in medicine and science curriculum, but it has also been applied in teaching history. (See Stallbaumer-Beishline, “Problem Based Learning in a History Classroom,” in Teaching History: A Journal of Methods, 2012.) Stephen Hausmann, an instructor in Temple’s History Department, contacted our Rebecca Lloyd, History’s library subject specialist, about using this approach for assignments in his General Education course, “Founding Philadelphia.” He hoped that this method of answering historical questions would increase student engagement and help them to develop information literacy and critical thinking skills. Rather than writing a research paper, the course was designed to have students working together in teams over the course of the semester to learn to think like historians and answer specific questions based on evidence drawn from primary sources. Librarian Rebecca Lloyd, held instruction sessions early in the semester to show students how to find and use the secondary and primary sources (drawn from her American history subject guide) that they would need to come up with answers to the PBL-based questions. She held follow up sessions to help with research and checked in throughout the semester to see how things were going. Question 1: The 1876 Philadelphia Exposition showcased the city as a modern, industrial, symbol of American strength and promise. This was very much in contrast with the dire economic situation the United States faced after the Panic of 1873. Look at some of the fair materials – in what ways did the Centennial Exposition foster this image? What attractions, items, displays, architecture, and landscape were used to create an American mythology at the event? Compare these with other collections from the 1870s. What contradictions do you see? In what ways was the exposition an accurate portrayal of late nineteenth century American life? Question 2: One job of a historian is to piece together the basics of daily life in the past for different groups of people. Find two sets of documents that catalogue two different people from Philadelphia’s history. How were their economic and social situations different and similar? Describe their daily lives as best as you can and explain how they compared with one another. What did they eat and drink? What about their leisure activities or family life? What about the work they did or how they otherwise earned their pay? 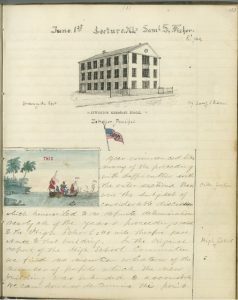 The SCRC materials used in this exercise were the Nathan S.C. Folwell Scrapbook, the George D. Shubert Diary, the Civil War Enlisted Slave Documents, the William Beatty Civil War Correspondence, Lectures on the Public Schools of Philadelphia, the Philadelphia Centennial Exposition Scrapbook, the History of the Society for the Relief of Poor Widows with Small Children, and selections from the Young Men’s Christian Association Records, the Alliance Israelite Universelle, Philadelphia Branch Minute Books, and the William Cramp and Sons Ship and Engine Building Company Records. We intend to encourage instructors to try PBL-based assignments in their courses, as a hands-on alternative to the traditional research paper. The SCRC is uniquely suited to collaborate on just such an approach. [W]hat we must do is to forge with others a national consensus to persuade the federal government to carry out that massive program that we have postponed for more than 25 years to deal with our massive social, political, and economic problems….That, my friends, is Jewish self-defense. Jewish self-defense is better schools…full and fair employment…full and fair housing….In short, Jewish self-defense is a dynamic, thriving democracy. In 1975, after failing to make any headway, the JCRC’s focus on gun control legislation began to wane. 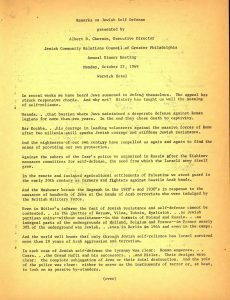 A change in the executive directorship brought a reassessment of priorities and a focus on Soviet Jewry and the defense of Israel. 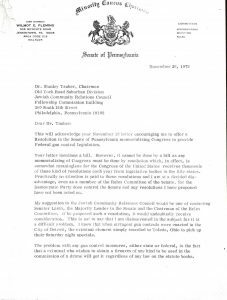 This is the fourth post of an occasional series highlighting the work of Philadelphia’s Jewish Community Relations Council (JCRC). 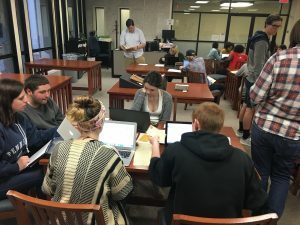 The records of the JCRC, housed in Temple University Libraries’ Special Collections Research Center, are currently being processed and will be available for research in late summer 2018. Just as the Centennial Exhibition of 1876 was captivating visitors in Philadelphia’s Fairmount Park, Fannie and Amelia Allen began chronicling their social and intellectual pursuits in their diaries. 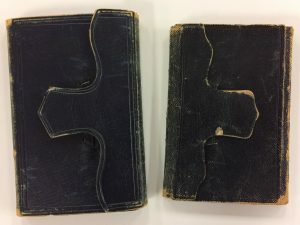 The Allen sisters filled their diaries with short summaries of the day’s events and longer, introspective passages that revealed their personal ambitions and struggles to find a mate who was both desirable and an intellectual match. Already working as a teacher, Amelia frequently writes about the challenges she experienced in the Hebrew Sunday School Society and Philadelphia Public Schools. Despite her desires, Amelia never married. She dedicated her life to education and social service. In 1885, along with other like-minded Jewish women, Amelia founded the Young Women’s Union, where under her tutelage adolescent girls learned domestic skills and in 1894 helped organize the women’s branch of the Young Men’s Hebrew Association. 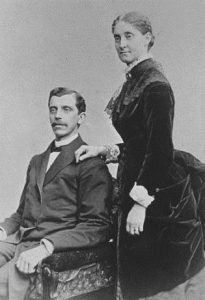 Nearly three years later on June 8, 1887, at the age of 32, Fannie married Moses De Ford, eight years her junior, but not before graduating from the Women’s Medical College of Pennsylvania. 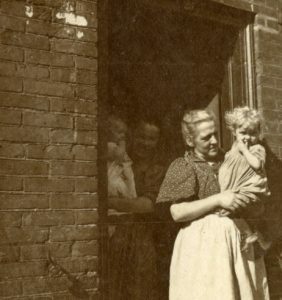 Fannie practiced medicine alongside her husband for over 30 years in the Kensington neighborhood, providing medical care to the immigrant population that worked in the textile mills and shipyards nearby, and advocated for better hygiene and sanitation for the working poor. On Christmas Day 1979, Mr. and Mrs. John Boston of the Alleyne Memorial AME Zion Church in West Philadelphia welcomed several Vietnamese refugees into their home for dinner. Earlier in the month, some 200 refugees accepted an invitation to attend services in their church. Part of the Human Relations Program, these inclusive gestures were coordinated by the Nationalities Service Center (NSC) in cooperation with numerous neighborhood associations, churches, social service organizations, and city departments. The program aimed for community involvement in refugee resettlement. 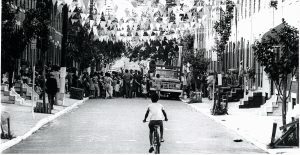 It developed out of necessity, as tensions were mounting in neighborhoods into which thousands of Southeast Asian refugees settled in just a few years. Ongoing conflict and political upheaval in Vietnam, Cambodia and Laos contributed to a worldwide refugee crisis in the late 1970s. 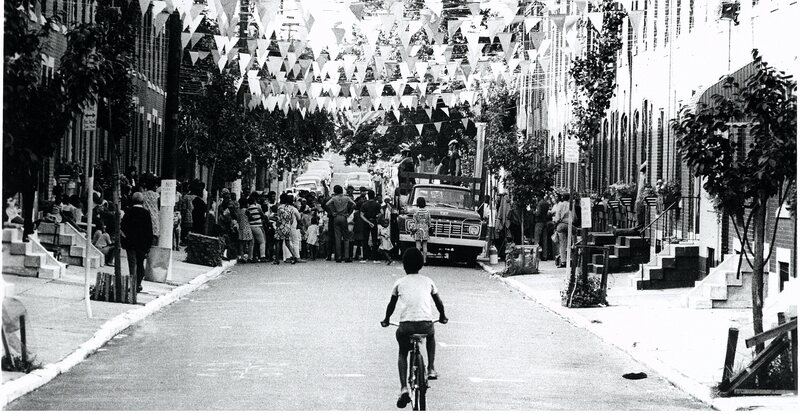 By 1980, NSC—just one of several area refugee resettlement agencies—had resettled over 3000 Southeast Asian refugees in Philadelphia, with a commitment to settle 75 people per week going forward. 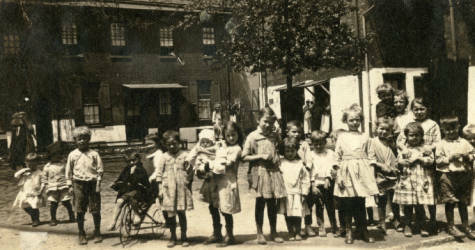 NSC settled the refugees primarily in West and North Philadelphia, where apartments were available and rents were low. 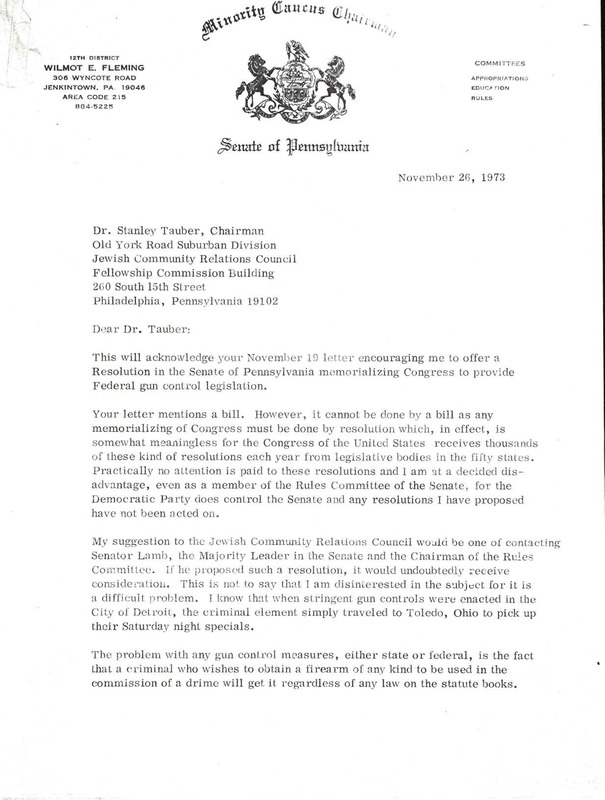 NSC did not consult or alert West or North Philadelphia residents to the influx of refugees, nor were the residents made aware of the political circumstances of their dislocation. Refugees, many of whom were from rural areas in their countries of origin, in turn were not initially educated in the workings of life in a modern American city or the culture of the neighborhoods into which they settled. The language barrier exacerbated matters. 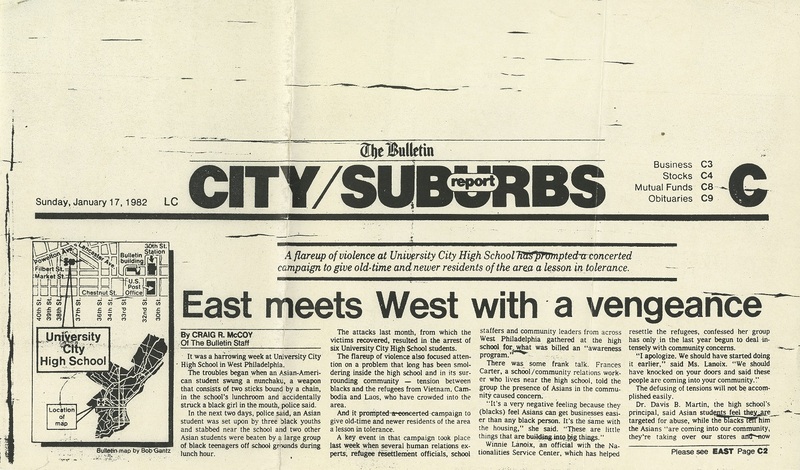 At University City High School, existing students misconstrued an ESL program established to assist SEA students as favoritism that gave them an unfair advantage. In Walnut Hill, NSC unknowingly placed refugees in apartment buildings deemed unfit for habitation and inadvertently undermined a boycott of the Dorsett apartment building. Refugees were reportedly harassed and robbed on the streets, neighborhood associations began to complain, and a general sense of anger and resentment permeated the neighborhoods. Several task-forces involving NSC, other resettlement agencies, assorted city and state departments, and social service organizations assembled in the city. What the media reported as racially motivated discord, NSC saw as a “human relations problem,” one that could be solved with education and community involvement. 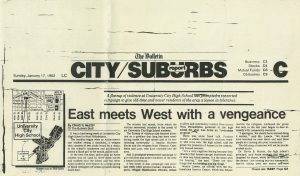 NSC’s Human Relations Program officially ran from 1979 to 1980, organizing events and programs to bring the SEA and other refugees together with their new communities. There was a cultural performance festival held that aimed to teach refugees about American culture. It included dancing, drama, singing, and disco. A field trip to a Phillies game, a summer sports program for children, block parties, and a church social at the Mount Carmel Baptist Church were also among the program’s offerings. Ultimately, NSC and the other task forces working on the issue found that “…public relations is of primary importance. Once informed about the refugees, most communities are receptive.” It was an important lesson to learn at the time. In addition to SEA refugees, private sponsors and settlement agencies were also contending with thousands of Cuban and Haitian refugees. In an effort to improve their ongoing resettlement work, at the conclusion of the Human Relations Project NSC planned to maintain project staff to continue hands-on community work. The Task Force on Inter-Group Crisis, of which NSC was a part, was also discussing a “comprehensive resettlement program and conflict avoidance…”. Of the many groups involved in ameliorating the refugee resettlement crisis, the Special Collections Research Center holds the archives of the Nationalities Services Center Records, Hebrew Immigrant Aid Society, Spruce Hill Community Association, West Philadelphia Corporation, and others. Each year in October, the Special Collections Research Center (SCRC) celebrates American Archives Month through dedicated programming that raises awareness about the value of archives. This year, the SCRC participated in the Archives Month Philly sponsored event, “Animals in the Archives,” at the Free Library of Philadelphia Parkway Central Library. The event featured over a dozen Philadelphia-area institutions including the Chemical Heritage Foundation, Presbyterian Historical Society, The Stoogeum, and the William Way LGBT Community Center, each of which brought along archival material and hands-on activities, all with animal related content. 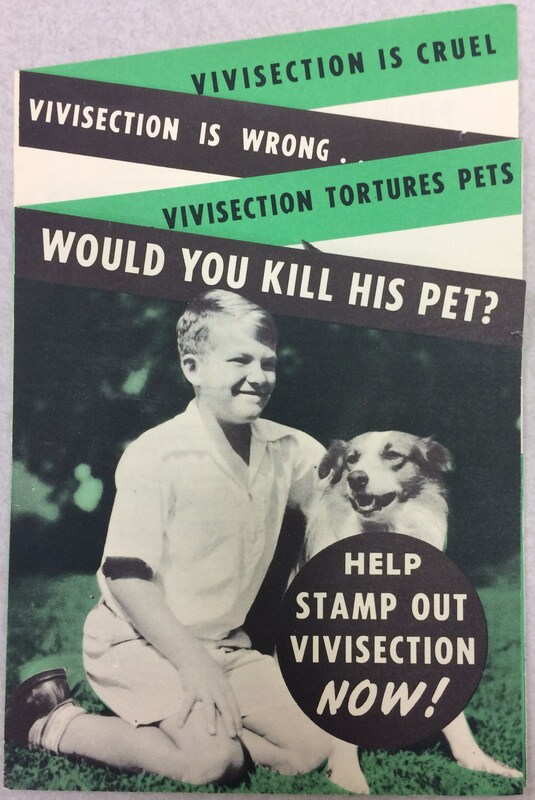 At the event, the SCRC featured publications, photographs, and printed materials from the archives of two local organizations founded in the 19th century, The Philadelphia Zoo and the American Anti-Vivisection Society (AAVS). 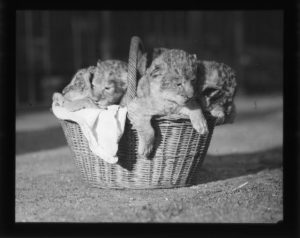 Throughout their existence, “America’s First Zoo” and AAVS have sought to educate the public about animals and animal welfare through organized programs. 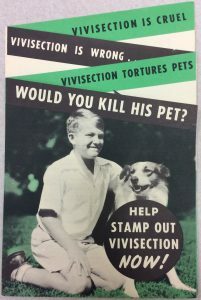 One of those programs was the Miss B’Kind Animal Protection Club, started in 1927 by AAVS Recording Secretary and Managing Director, Nina Halvey. Halvey taught humane education in private and parochial schools throughout the Philadelphia region as part of the AAVS’ effort to combat the use of animals in scientific experimentation. 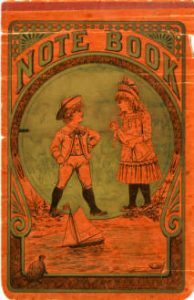 The club also hosted meetings for children ages 8 to 16 at the AAVS headquarters every other Saturday and provided a correspondence membership for children across the U.S, Canada, England, Ireland, and Australia. Club members pledged “I will be kind to animals now and when I grow up.” Halvey promoted the club through lectures and a radio show series on WPEN called “Dogs I Know About.” In 1931, Halvey received a humanitarian prize from the Geneva International Bureau for the Protection of Animals for her humane education work related to the Miss B’Kind Club. The Libraries are celebrating the 50th anniversary of the founding of the Urban Archives with an exhibit, a screening, and symposium. 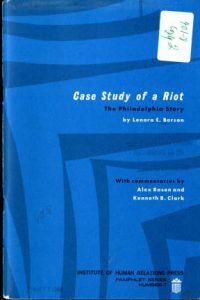 In 1967, when Temple University’s history department decided to collect the records of city organizations in order to document the history of Philadelphia from the Civil War to the present, and more generally represent the urban experience, the faculty may not have imagined how the archives would evolve. They were interested in gathering raw material for their graduate students’ research use. Since then the Urban Archives has evolved into the most extensive collection of 20th century Philadelphia history in the region, holding the archives of hundreds of city and regional organizations–from a few to thousands of boxes each. 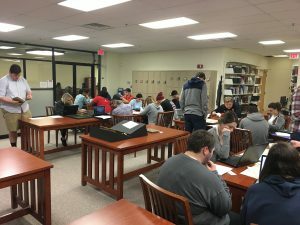 And it’s holding are used not only by undergraduate and graduate students, but by high school students, scholars from all over the world, the media, documentary producers, and the general public. The late sixties was something of a turning point in the study of history. As Fred Miller, who served as director from 1973 to 1989, put it: “The archives owes its existence to…the growth within the historical profession of the study of social history; the crisis of the cities, which led to the rise of a veritable urban research industry; and the growth of higher education, during which Temple became a major research university.” Fred arrived shortly after the administration of the archives was transferred to the Libraries (in 1972). And he was succeeded by Margaret Jerrido, who was head of the archives from 1990 until her retirement in 2007. 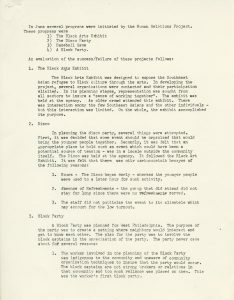 It’s striking how true the archives has stayed to its original purpose, described in the 1968 History Department press release announcing the archives as “creation of a new manuscript collection focusing on urban life and development and drawing on the Philadelphia metropolitan area since the Civil War. 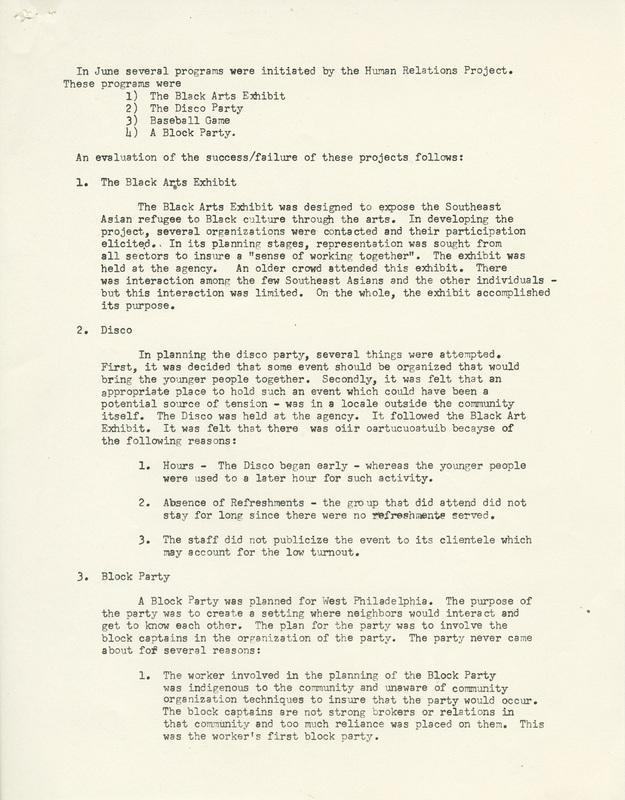 The collection will collect institutional and individual records which will illuminate ethnic and racial groups, social welfare, crime, education, religion, economic development, and political activity.” Neighborhood association records became a strength, and in the early 1980s a major initiative to collect labor records increased those collections. And the archives continues to grow, adding, in the past few years, the archives of Occupy Philadelphia, the Philadelphia Zoo, the Weavers Way Co-op Records , and the Philadelphia Association of Community Development Associations to name a few. Many of the earliest collections gathered in between 1967 and 1969 by the history department, the first director Phillip Benjamin, and a team of graduate students remain the most frequently used, including the first major collection: the records of the Housing Association of the Delaware Valley. 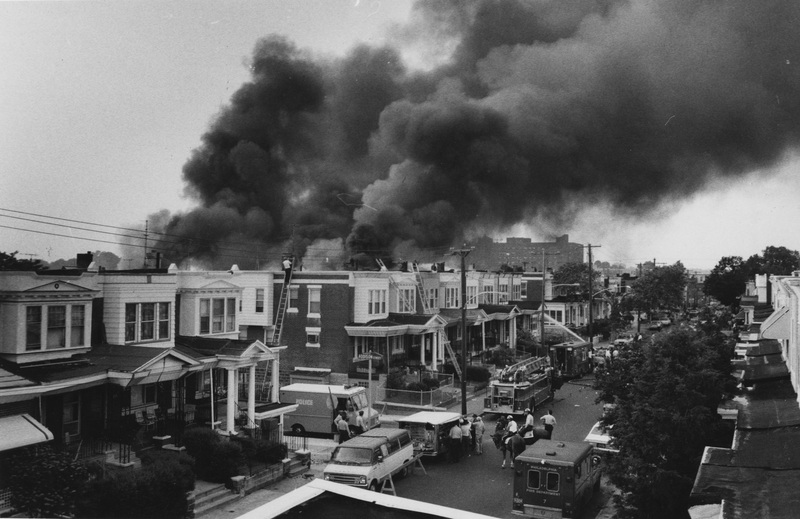 The Urban Archives has also become know for holding the photograph and clippings library of the Philadelphia Evening Bulletin–and for being the premiere location for the study of MOVE and the MOVE bombing in 1985. Representing the hundreds of graduate students, from Temple, Penn, Yale, Duke, and across the country and the world, who have used the archives in their work, is Matthew Countryman, whose dissertation, researched at the Urban Archives among other archives in the city, became the monograph Up South: Civil Rights and Black Power in Philadelphia. Matthew is Associate Professor of History and the Director of the Arts and Citizenship Program at the University of Michigan, and we are also grateful to him for his work with us on our Civil Rights in a Northern City website. At the symposium, we are privileged to have Herb Bass, Emeritus Professor of History, with us, who was present at the creation, to tell us more about that. Matthew Countryman, Margaret Jerrido, Ang Reidell (Education Specialist, National Archives and Records Administration-Philadelphia); Frank Hoeber; Joe Slobodzian, a Philadelphia Inquirer reporter; and Sam Katz from History Making Productions. We asked the to talk about their time with the Urban Archives and perhaps speculate where the next fifty years should take us. 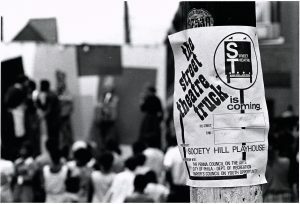 During the summers of 1968, 1969, and 1970, the Society Hill Playhouse (SHP) took theater to the streets of Philadelphia and Camden. 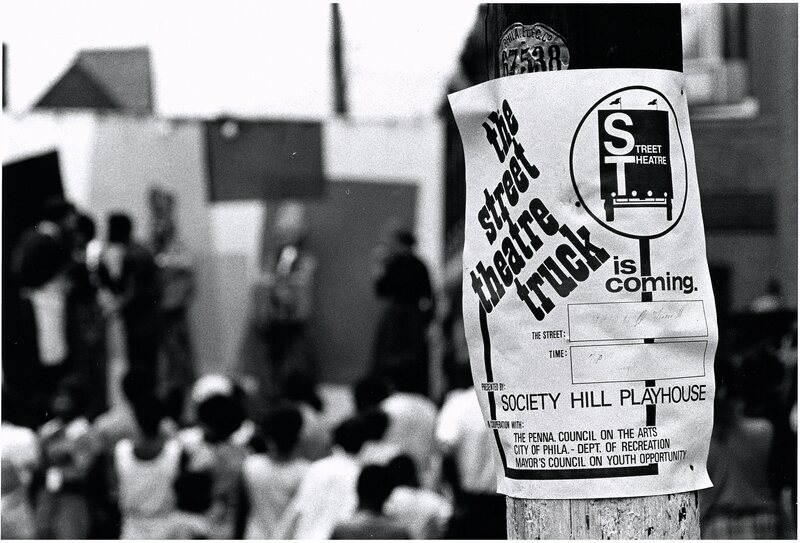 SHP inaugurated its Street Theatre Program for “Better Break ’68,” a program created by Philadelphia Mayor Jim Tate’s Council on Youth Opportunity. The Better Break program collaborated with businesses, organizations, and individuals across the City to offer a variety of educational, recreational, and cultural opportunities for Philadelphia’s youth and families. SHP’s Street Theatre was among several performing arts entertainments offered as part of Better Break. It turned a flatbed truck into a stage, which traveled to neighborhoods across the City. A deliberately integrated cast performed a series of skits that addressed tenant life and the Vietnam War, among other relevant issues of the day, and offered some upbeat musical numbers as well. Deen Kogan and husband, Jay – both Temple graduates – launched SHP in 1959 as Philadelphia’s “off-Broadway” theatre for contemporary American and European playwrights. Gradually, it developed a niche in populist comedies, like Nunsense, and, in cooperation with the City of Philadelphia, it presented major productions city-wide. It’s other programs included the Writers Project, beginning in 1962, which was dedicated to developing new works, and the Philadelphia Youth Theatre, 1970-1983, which drew students from public, private, and parochial schools. SHP was located in the Society Hill District, housed in the historic former David Garrick Hall. The theater closed on April 1, 2016. 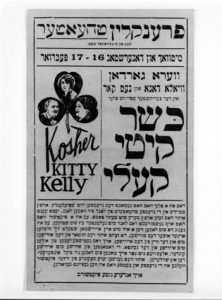 Deen Kogan donated the Society Hill Playhouse Records to the Special Collections Research Center in 2016. A finding aid is available to provide more information about ithe collection. What in the World is a Vertical File? Libraries and archives often maintain what they arcanely call “vertical files,” defined by Merriam-Webster as “a collection of articles (as pamphlets and clippings) that is maintained (as in a library) to answer brief questions or to provide points of information not easily located.” Other definitions note that the items in the file are too minor to require individual cataloging. And “vertical” refers to the actual storage orientation of the file folders—upright, often in a filing cabinet. These files are simultaneously rich and idiosyncratic in content. A user never knows what might turn up and learns to enjoy the serendipity of finding a rich file, while being resigned to the disappointment of a skinny one. 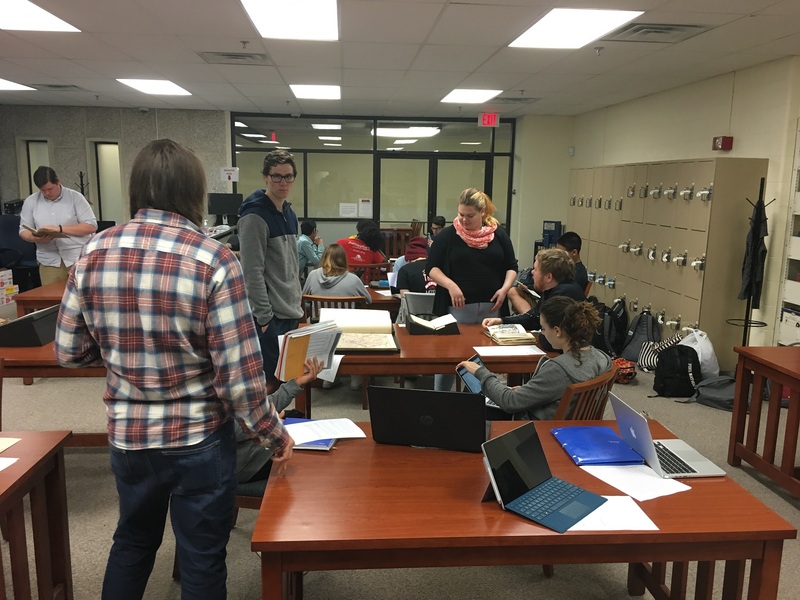 Temple University Libraries’ Special Collection Research Center maintains several such files. In the Philadelphia Jewish Archives, there are the Vertical Files on the Jewish Community of Greater Philadelphia which is an accumulation of items that document Jewish history in Philadelphia. The collection include photocopies of newspaper articles, pamphlets, family histories and genealogies, ephemeral items such as brochures, flyers and event programs and other miscellaneous materials relating to persons, places, organizations, and topical subjects. 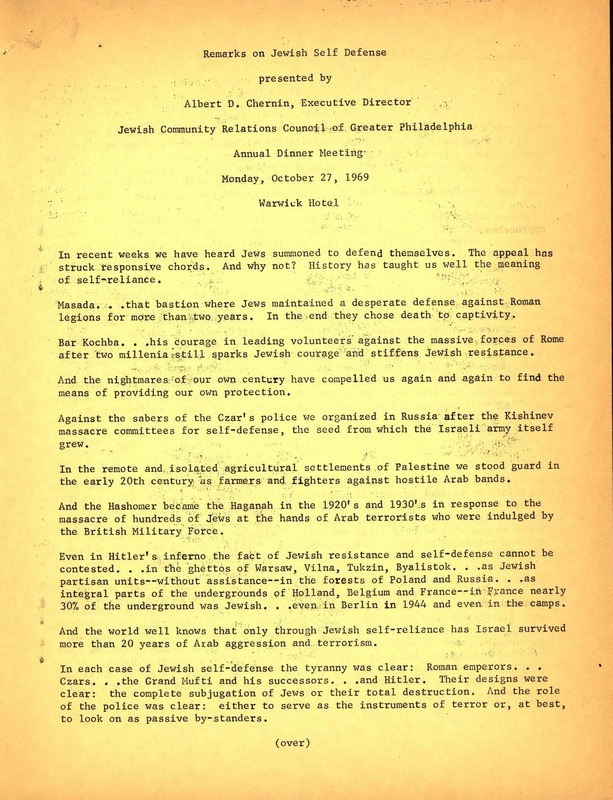 The files provide background information on cultural and historical events, businesses, and community members of the Jewish community in the Greater Philadelphia region and parts of southern New Jersey. The inventory to the Temple University Archives Vertical File was recently put on line. It documents Temple’s founder Russell Conwell and many aspects of the University’s history. 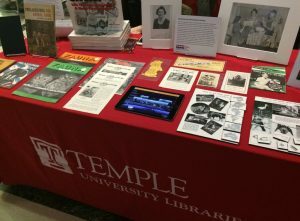 The collection contains publications, pamphlets, flyers and event programs, newspaper clippings, and other materials gathered from university offices and various news sources relating to persons, places, organizations, and topical subjects that document Temple University. We’re reviewing the Science Fiction Collection Vertical File and the Dance Collection Vertical Files and hope to have information available about their contents soon. Are these vertical files going the way of the dinosaur? At the moment, they are often superior to any search engine—or at least as good as the staff who faithfully gather and file the items—and serve as a great starting point and resource for many topics. 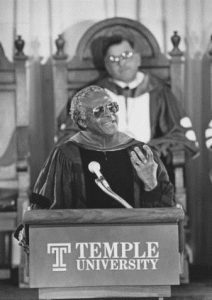 Did you want to know about the Temple-Community Charrette of 1970; the model UN Conference that began at Temple in 1946; what Desmond Tutu said to the Temple community when he received an honorary degree in 1986? Start with the vertical file! 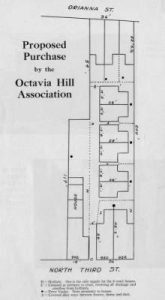 The Octavia Hill Association was incorporated in 1896 to improve working class housing conditions through the sympathetic management of dwellings which it purchased and renovated. The association’s activities were modeled after the work in London of Octavia Hill, with whom one of its founders, Helen Parrish, had studied. Helen Parrish who served as secretary for the association, kept a diary in 1888, and created correspondence, notes, reports, and other publications describing the associations’ work, (1888-1943). The OHA archives are housed at Temple University Libraries’ Special Collections Research Center. 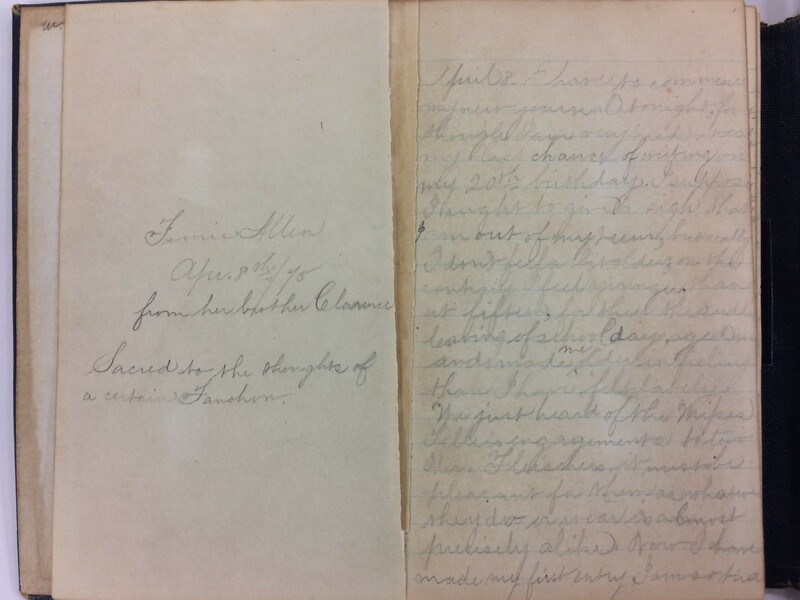 Parrish’s 1888 diaries (in three volumes) were recently digitized and describe her “friendly visits” to OHA’s tenants. In common with other social welfare activists of the era, Parrish and other agency staff members believed that part of their role was to police tenants’ behavior. In addition to the diaries, many of the images in the OHA archives have been digitized, illustrating housing interiors and exteriors before and after renovations, court yards, and street scenes around Philadelphia. 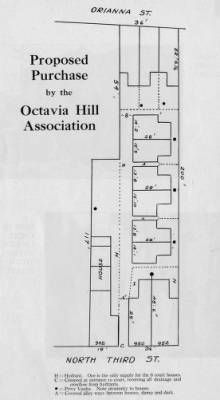 Additional material from the Octavia Hill Association archives is in the process of being digitized and will be available both through Temple Libraries and through a pilot site “In Her Own Right: Women Asserting Their Civil Rights, 1820-1920,” being built as a part of a NEH planning grant received by the Philadelphia Area Consortium of Special Collections Libraries which looks toward commemorating the 100th anniversary of women receiving the vote in 2020.